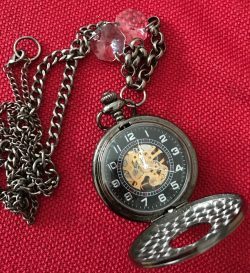 An Example of a MacGuffin is this Pocket Watch Necklace. Made for me by Vintage Fusion Jewels. A MacGuffin is an object, item or other motivator that gets the protagonist moving in a story. It’s a plot device, but rather than being a personal interaction, it’s generally some sort of physical object. George Lucas famously defined MacGuffins as “the object of everybody’s search.” A MacGuffin can be anything from a piece of jewelry, to a book, to a sacred place. For my own personal inspiration, I adore the manga “xxxHolic.” In it, a young boy encounters the mysterious Yuko. She’s the owner of a shop that is very similar to another shop I’ve read about by Stephen King in his novel, “Needful Things.” In both cases, the items sold in these shops lead their purchasers into more harm than good. MacGuffins are especially fun storytelling devices for the YA market. Harry Potter contains many MacGuffins including my all time favorite, a MacGuffin inside a MacGuffin. The resurrection stone hidden safely inside the golden snitch will always be on my list of favorite plot devices. What all of these items amount to, is a driving force to keep a plot in motion. Once the item is in motion, the plot rolls along with it until the item is located, or the item has performed its specific task, or is deemed lost forever. No matter which way you choose, the item makes it easier for a writer to move the story forward. Just move the item to the next location and figure out how the seekers locate it. It’s that easy. I’d love to hear about some of your favorite MacGuffins! Comment on the post on Facebook or follow me on Twitter and let me know what some of your favorites are!